3 human-scale representations of festival-goers (amalgams as opposed to anyone specific). Each have a peephole through which to see video, and each has sound. This time, Potter-Belmar is joined by artist Noel Stupek [a.k.a. Sensate Images] of St. Paul Minnesota. Images were first made to conjure up the appearences of something that was absent.... Later, the specific vision of the image-maker was also recognized as a part of the record.An image became a record of how X had seen Y. The Portraits of a Spectator Nos. 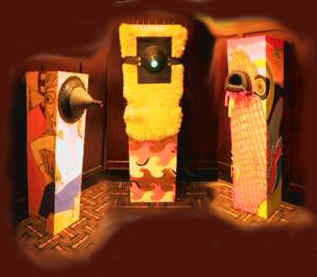 1-3 made their debut in the concourse of the Michigan Theatre lobby during the 39th Ann Arbor Film Festival in March 2001. This work was included in the Playground Show, a group exhibition at the Warren Robbins Gallery, University of Michigan School of Art & Design in the summer of 2003.